« Blues On The Green Returns! Happy National Donut Day everyone!! If you haven’t already, stop by a Krispy Kreme near you to receive one free glazed donut. Dunkin Donuts is also offering one free donut with the purchase of any beverage. Since we’re honoring the beloved donut on this day, I had to share with you all one of my favorite easy donut recipes. 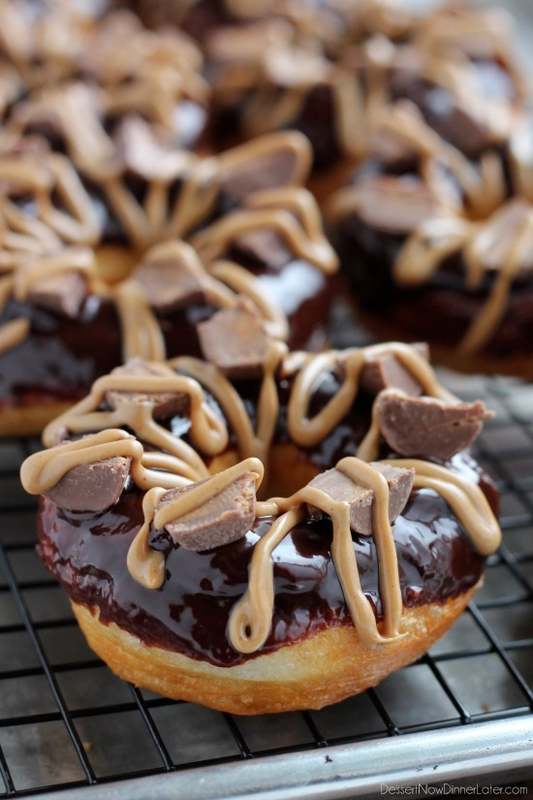 These are for the chocolate peanut butter lovers out there! 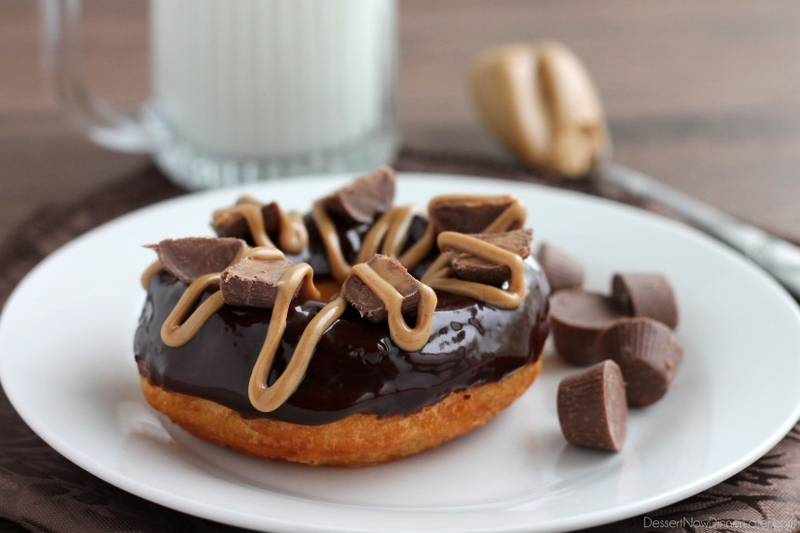 I mean what better combination to put on a donut? What makes this donut recipe so easy is that they are made with Pillsbury Grand Homestyle Buttermilk Biscuits. Homemade dough is great but for those of you who need a time saver like I do, these make a great substitution and they taste fantastic! 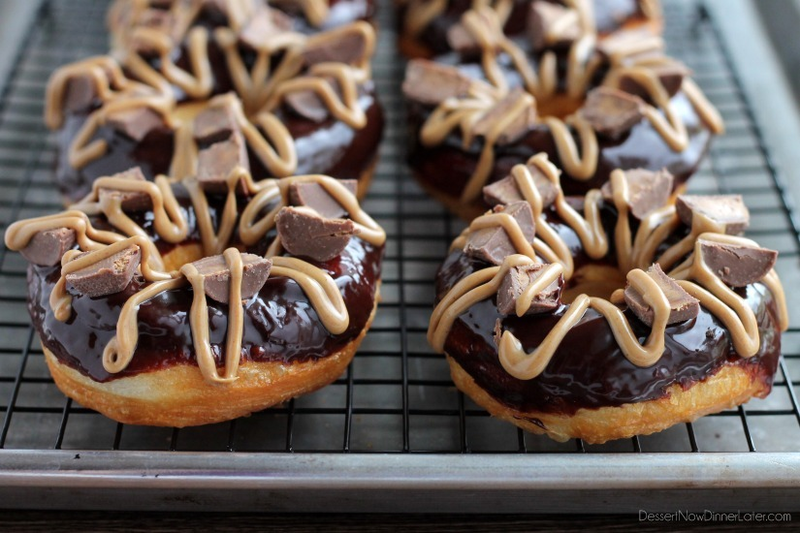 These donuts are dark and decadent and incredibly delicious while also gourmet. 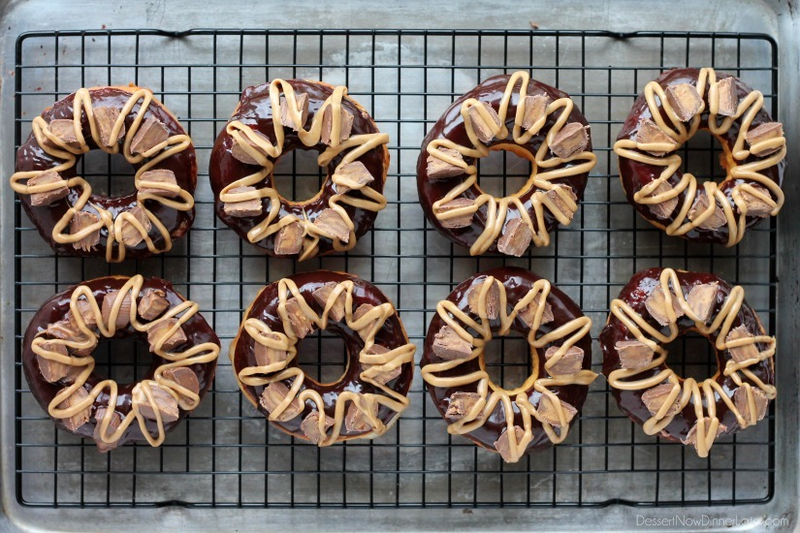 I mean who would have thought you could make donuts like these in your own kitchen? These are sure to be a crowd pleaser with everyone! Fill a large stock pot or dutch oven with oil 2 to 3 inches high from the bottom. Heat oil on medium heat. Open the can of biscuits and separate each one. Flatten each biscuit slightly with your hand and cut out the centers with a small biscuit cutter. Once the oil is hot, fry donuts 3 or 4 at a time until golden brown on each side, using a wooden skewer or metal spatula to turn them over. Remove the donuts and place them on a paper towel lined baking sheet, until they are slightly cooled down. Repeat with remaining dough. Heat heavy cream in the microwave for 30 seconds or until it simmers, but watch it to make sure it doesn’t spill over. Pour hot cream over chocolate chips and stir until smooth. Add the halved peanut butter cups after the ganache has mostly cooled down; if it’s too hot still, it will melt the peanut butter cups. Heat the peanut butter in the microwave for 15 seconds or until slightly melty, but not runny. Scoop the warm peanut butter into a zip top bag, seal it shut, then cut off the corner, and while squeezing, zig-zag the peanut butter over each donut. Enjoy! Store any extra donuts in a container with a lid for a day or two.